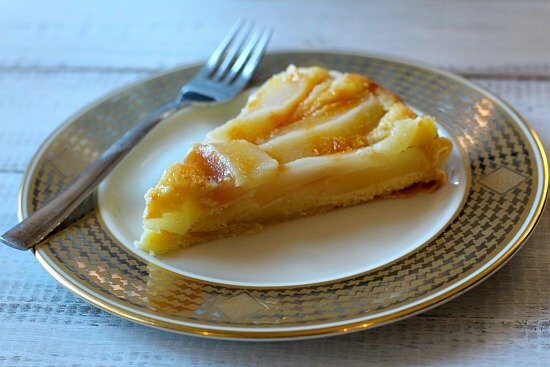 This is a recipe for a French Pear Tart Bourdaloue. Add some apricot rum glaze for a finishing touch of color and pure delightful flavor. Impress with this beautiful dessert. If you’re a regular reader you know that in September, I graduated from Culinary School. 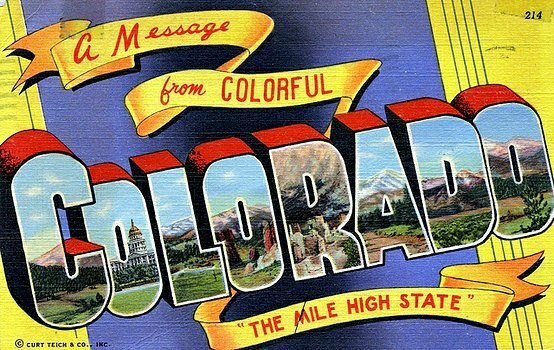 A good part of that schooling included time in the Pastry Kitchen, learning classic French Baking Techniques…and learning from one of the best pastry chefs in Denver, Jenna DiLullo. Invaluable training for me the anti-baker. I’m totally amazed at the skills I’ve learned. All of which led me to make this French Pear Tart at home and with confidence. This was my second tart attempt. A Fresh Peach Curd Tart was my first dessert project. Additionally, a Fresh Tomato Tart with Gruyere was my savory project. 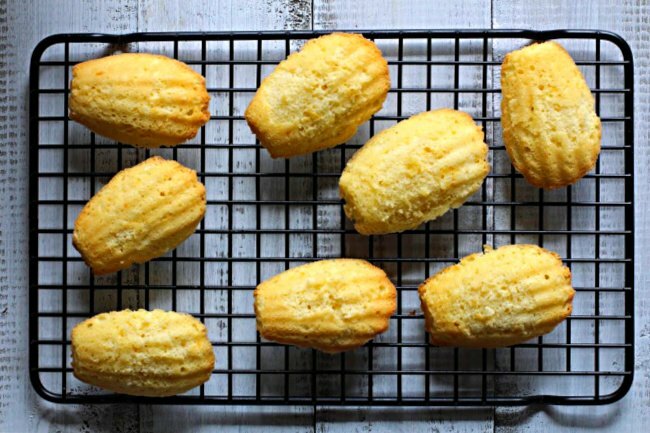 This is a classic French pastry created by famed patissier Paul Coquelin of La Patisserie Bourdaloue in Paris. 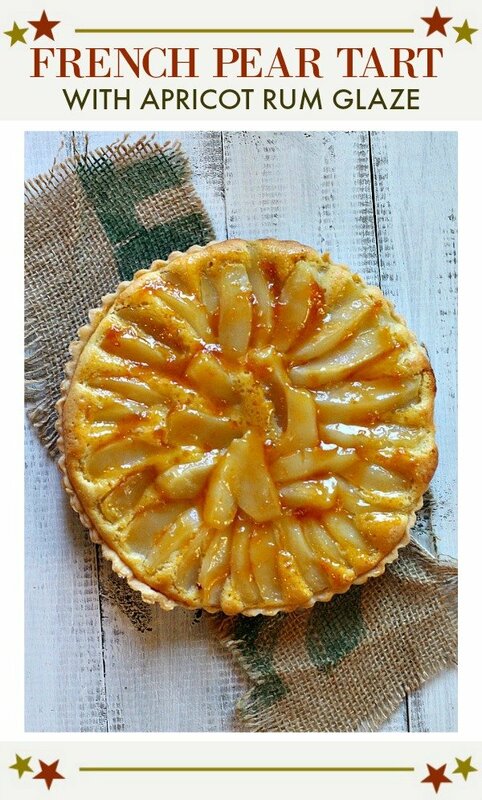 It’s a pear tart with frangipane (almond cream, or an almond based pastry cream). Certain desserts stand the test of time and this is one of those classics. I recently made it for the first time and served it to dinner guests. It’s a rewarding tart to make and impressive for entertaining. And did I mention divine with flavor? For this recipe, you can use a tart pan that varies in size between 9 an 11 inches. I used a 9-inch tart pan and had Frangipane left over. The amount of pears worked fine and doesn’t need to be adjusted. The baking temperature and time for each size tart pan should remain the same. For this recipe, you’ll use a Pate Sucree shell instead of a regular Pate Brisee tart crust. Pate Sucree is a sweet pie crust most commonly used for French fruit tarts. You can find a recipe for Pate Sucree at Saveur Magazine. How to use a vanilla bean: With a sharp knife, slice the vanilla bean in half length ways. With the back of a knife, scrape out the pulp. 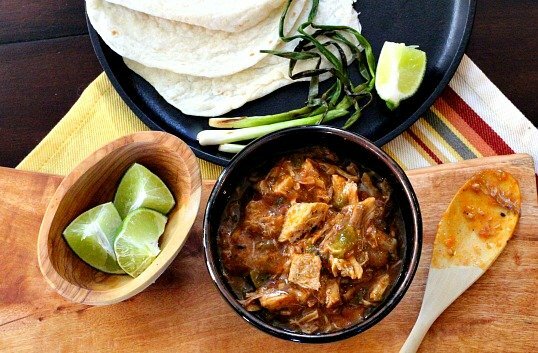 Easy and fabulous with flavor. If you can’t find vanilla bean, substitute with 1 teaspoon vanilla extract. Adding 4 beaten eggs, one at a time: This recipe calls for adding 4 beaten eggs one at a time. No need to beat eggs in separate bowls. Beat them all in one bowl and just pour in an estimated amount of egg equaling 1 egg, at a time. How to blind bake your crust: Blind baking means to pre-bake a pie shell crust before adding filling. Once you’ve formed the dough into the tart pan, simple cover it with a sheet of parchment paper. Using pie weights or dried beans, fill the covered shell to weight down the parchment paper so it’s touching the pie crust. This will keep the crust from bubbling up, which would make it impossible to fill with the frangipane. What does docking mean: Docking is no more complicated than simply pricking the dough with a fork. Several times on the bottom and on the sides. I strongly suggest that you make the Apricot Rum Glaze to finish the tart. It adds a beautiful golden hue to the finished product and another layer of great flavor. 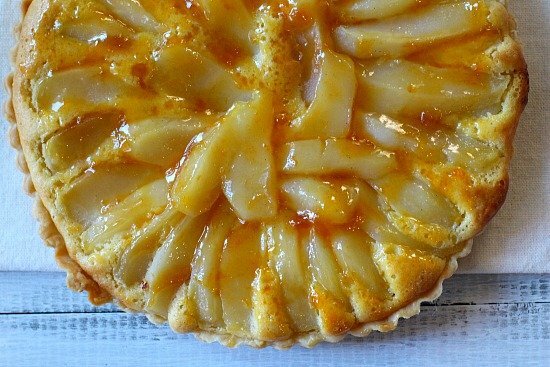 I hope you give this French Pear Tart recipe a try. And if you do, please come back and let me know how you liked it and give the recipe a star rating. Your feedback is valuable to me for developing future recipes. 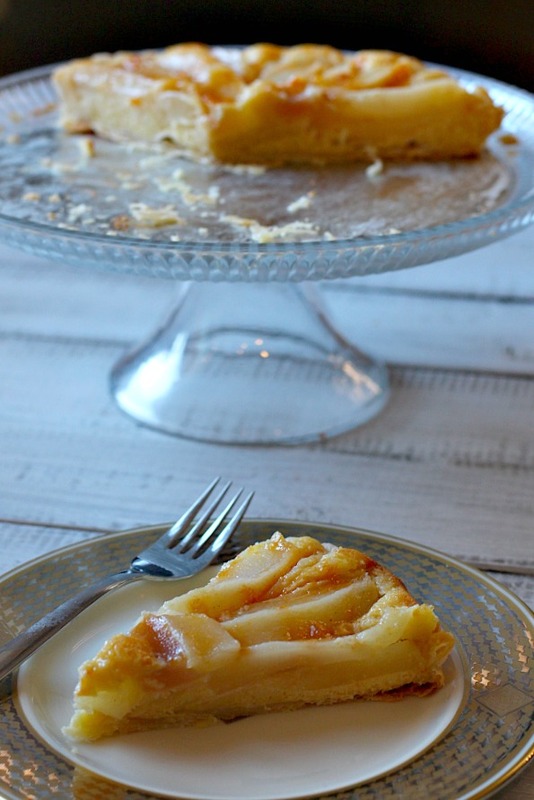 And if you have a favorite pear tart or pie recipe, let me know, I’d love to give it a try. 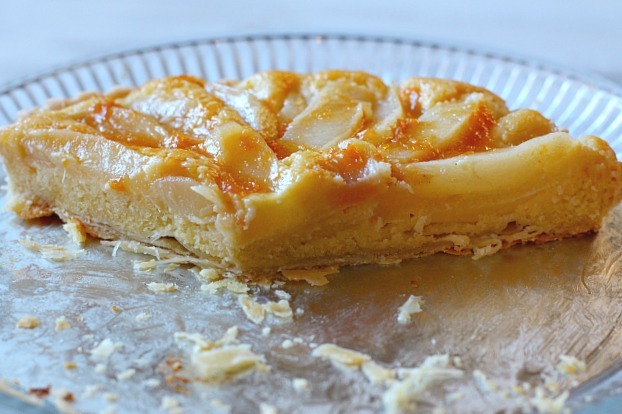 A beautiful work of art, this French pear tart with Frangipane is an elegant pear dessert. Preheat oven to 375 degrees. Place the pie dough into a 9" round tart pan. With a fork, dock the shell. (poking holes on the bottom and sides) Place parchment paper over the shell and place dried beans on top to weight down the parchment paper. This will keep the dough from bubbling up when baking. Blind bake the shell for 15 minutes. Remove the beans and parchment paper and cook for another 10 minutes. Remove from oven and cool. Peel, core, and half the pears. Immediately place the pears in a saucepan with lemon juice and enough ice water to cover them. Add the sugar and the vanilla bean. Cover the pears with a round of baking paper and simmer over medium heat until they are just tender. Remove pears from the syrup and drain to prevent over cooking. For the Frangipane: Cream the butter with the sugar. Add almond flour and mix until smooth. Add the eggs one at a time and mix until each is absorbed. Stir in the all purpose flour and the rum. Use immediately, or can be stored covered in refrigerator up to four days. Slice pears 3/8" thick. Fill the cooled tart shell with 12 ounces frangipane about 1/2" thick. Place the pears over the frangipane in a fan pattern. Bake until the shell is lightly golden and the frangipane has risen and colored. About 40 minutes. Cool and finish with warmed apricot glaze. For the Apricot Glaze: In a small saucepan, add 3/4 cup Apricot preserves and the 1 tablespoon golden rum. Cook over medium heat until nice and syrupy. You may make a caramel sauce to accompany the Pear Tart Bordaloue by reducing the liquid in which the pears were cooked to a caramel. Then add heavy cream. Sounds yummy Lea Ann and perfect for fall. It seems like you just started culinary school and now you are finished! Congrats! It doesn’t quite seem that way to me. It was a loooong, hard Summer – and very rewarding and fun. What a beautiful tart! Yummy glaze. That glaze was a hit! Plus it added some needed color. Thanks Debra. This is where I get really weak – French tarts of all kinds. This sounds so incredibly delicious! Thank you for the recipe! I’m a recent fan since I learned to make them at Culinary School. So rewarding. This is gorgeous! Tarts always look so interesting (and pretty! ), don’t they? Bet the flavor of this is out-of-the-world. Love the glaze, too. Good stuff — thanks. Lea Ann, it looks like you are a real pro now…lovely tart. Thank you so much, and thanks for sharing my love for those tarts! Omg, this is an amazing dessert! It was a lot of work, but well with it. I was confused with some ingredients measured in ounces, and some in cup measurements. But I figured it out, and it turned out wonderful. It tasted like a professionally made tart. My husband said it was the best dessert ever. Thank you so much for letting me know Rebecca. I agree, it’s a little tedious to make, but very rewarding in end. RE: those measurements, that’s culinary school for you. I’ll head back over and take a look and see if I can make it easier. This is a beautiful tart and it’s baking now, so I’m hoping it will taste as good as it looks. I do think the directions should be tweaked. First of all, use cups instead of ounces and be consistent with those measurements. It would be nice to give the Frangipane recipe in a separate place instead of in the baking sequence, just a little confusing. I think the organization of the ingredients and then the parts (Frangipane and the apricot glaze) is confusing. Sorry, I’m an educator and work with student teachers and their lesson plans and we discuss how to sequence the procedures.